SuperCopier replaces Windows file copy dialog box with something cleaner and more detailed, as well as adding functions like pausing, skipping a file, copy lists, and file transfer speed throttling. How to extract: Download the "Supercopier Windows 32/64Bits Portable Free" ZIP package and extract to a folder of your choice. Launch Supercopier.exe. The current version seems to be Supercopier 1.2.0.3 (http://ultracopier.first-world.info/supercopier.html), but the version numbering is confusing. SO much version, seem this software is not free after version 2 ? Baas - thanks, updated. I didn't update the version number, just fixed the broken link. Looks like its gone, link to website is dead. Its available around the place but theres no .exe to extract, and yes it said windows version? I have been a long time user of SuperCopier and was mighty glad when I noticed (a while ago) that it had been updated to version 2.2 Beta. I proceeded to install it and use. Great, Admin privileges were no longer needed to run it and it supposedly could be made portable (I never tried it). Unfortunately, it had a few too many quirks and dealt poorly with my heavily customized working environment so I reverted back to SuperCopier 2 Beta 1.9, which I'm still using on my desktop machine (on my lappie, I went for Teracopy). Updated entry links as the old one were not working, and were currently invalid/expired. This application works very well for me on XP SP2, and it worked on Vista Home also. It does what other programs claim to do and yet fail. It's settings are decent without having any unexpected snafus hiddin in .INI files or registry hives. There's even a safety mode in case you have troubles with the speed optimized normal settings. 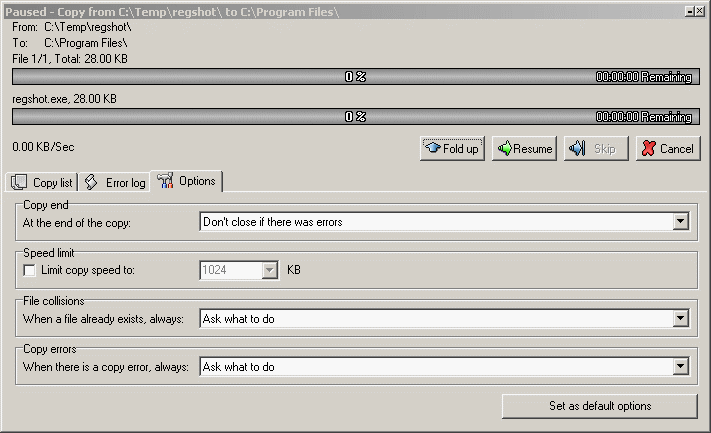 You can even sort and rearrange the list of programs being copied or moved. This is useful for copying items from large to small, therefore optimizing space used on your destination storage volume. Funny that it's a beta, it works better than the non-beta's I'm used to using. Last but not least, the progress charts are very informative. I do wish it had a merge function like Vista has, but freefilesync can take care of that. Looks like the portable instructions still work too. Its a cute copier . I love it. but it sounds like a new versions is in the works for release soon... lets hope! dead link, program is not available anymore. Apparently the site is down or gone. When I downloaded it before the ZIP file was 4k, with nothing in it. It sounded good. Hopefully it'll be available again. Doesn't seem to work well via networks, the program freezes and can't be stopped unless you nuke the task. Don't know if any of you have an ordinary Mp3 player where you copy your files as if it was a pendrive. I had problems when copying some files where the files in the playlist were 'out of order'. Well i tried SuperCopier and i don't get that problem anymore. Excellent program. Easy to use and many useful options that explorer lacks. My only wish is that it could be used not only for copying but deleting files as well. I just started to use it,and i love it, so far. When i copied big files to my TrueCrypt-Usb Partition,for some reason Windows and CopyHandler uses more than 60% of my cpu, with SuperCopier its now under 30%. This app is quite cool! I am trying it out as a replacement to CopyHandler and so far, it is working really well. I am really wild about the Unicode support too. Note that if you are using a different file explorer, you need to add the EXE under "Handled processes". Out of the box, only "explorer.exe" is on the list.